Putting ice in your drinks is essential to keep it nice and cold and to bring out all of the flavor. However, it is never fun when the ice melts too fast and your drink gets that awful, water-downed taste. When we at Consumer's Survey found the Tovolo Sphere Ice Molds, we definitely wanted to try them out. This product already had several hundred great reviews online as well, so we had great expectations as we set out to get one for ourselves. Why Choose These Ice Molds? The clever and innovative design gives you a two and a half inch sphere of ice, which is the perfect accompaniment to your Rye Whisky, Irish Whiskey, Bourbon and other drinks. These slow melting spheres bring out the full flavors of your drinks. These spheres add a splash of class to your drinks, and are perfect for your next dinner party. Each silicone mold measures three and a half inches in diameter and six inches tall. You can find room in any freeze for this ice mold, as it stacks easily so it will save space, and it also will not tip over. The cap of silicone makes the perfect seal that is leak-proof. These Tovolo Sphere Ice Molds really are a neat invention and work well for all kinds of cocktails and drinks. The molds work perfectly when you use as directed, and you can achieve a clear, practically perfect two and a half sphere of ice each and every time. The mold is very durable and is well constructed from materials which are food grade. You can even get clearer ice if you use boiled or filtered water. We really enjoyed how well these spheres come out of the mold and work to keep drinks cold without watering them down. For your next cocktail or dinner party, these molds will be a big hit. Everyone will be crowding around to see what you are putting in people's drinks because they are so unique. The large balls of ice that these molds make look really neat in one's drink and truly melt slowly so you can enjoy the full flavor without the watered down taste of regular ice cubes. We even experimented with putting fresh fruit in the ice spheres, which not only looks really great, but you can also match up the fruit with the drinks you are going to make to add another flair to everyone's drinks. Since the spheres that the molds make are a good size, you might want to measure any of your bar glasses first before purchasing the molds, as there were a few people who had trouble with the ice being too large. It is also recommended that you run the mold under warm water first if you are experiencing any trouble getting the spheres to come out. 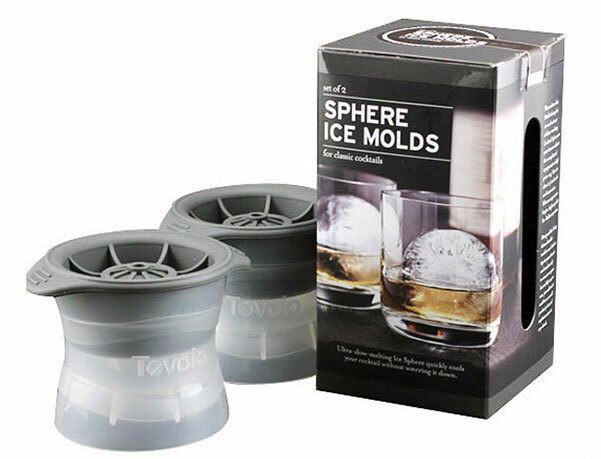 Overall, however, these Tovolo Sphere Ice Molds really are a neat little invention which we were very pleased with.